The big surprise of Practice was the performance of the Toyotas; they are up there messing with the McLarens, Ralf just a shade quicker than Trulli. 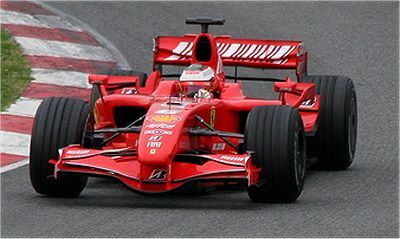 For a change, Raikkonen was the quicker of the Ferrari drivers, nearly half a second separating him from Massa in second spot. The weekend is yet young but Ferrari are certainly living up to their confidence so far. Ralf grabbed third fastest, seven tenths behind Kimi, and only then do the McLarens begin to show up, Hamilton the faster of the two and claiming fourth. Then came Trulli, confirming the pace of the Toyotas, and Alonso sixth fastest. Once again, it seems that the return to Europe has brought a change in fortunes for many teams. Toyota may fade as the weekend progresses but there can be no doubt that they have succeeded in making the car a lot faster since the American races. Behind the first six, Williams looked good in both sessions, ending up 7th (Rosberg) and 8th (Wurz), and Renault started poorly but improved to 11th (Kovalainen) and 12th (Fisichella) ultimately. BMW were in 13th and 15th spots by the end but had actually gone quicker in the first session; expect them to be back up in contention by the time Qualifying arrives. The big disappointments were reserved for Honda and Red Bull, although the latter did manage to hoist Webber into ninth by the end. Honda remain firmly behind their B team, Super Aguri, and Coulthard languished in 14th. Toro Rosso fell away from their recent improvement in form and kept the Spykers company at the tail end. But at least Speed was quicker than Liuzzi in both sessions, some consolation for me in my capacity as sole member of the Scott Speed Fan Club (well, it feels like it sometimes). The full timesheet for the second session can be found on the Autosport website. Looks like there's a chance this weekend will remain dry though (for a change I'm sick of the rain).